Executive Order Corp takes the exploding IoT, bots and cloud services using the internet to enable new use cases and new business models across multiple markets and application to a new level of environment monitoring and equipment condition telematics solutions for your business. With EOSPY main control window, we tie all IoT information on one live map screen. Get all the data you need to manage your equipment more effectively – smart device management. Control costs, improve safety, route vehicles and equipment more efficiently, and streamline maintenance processes. EOSPY has support for more low power sensors – Connect Bluetooth smart or WiFi sensors and get sensor data online in the EOSPY GPS map. 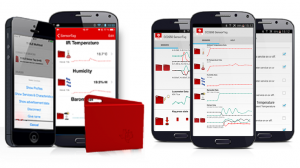 The EOSPY industry first IoT development enables easy and quick integration of sensor data with cloud connectivity. EOSpy-TI offers low power wireless connectivity to be integrated into any product. The IR temperature sensor, for example, warns if a device’s motor is overheating. A humidity sensor can detect if moisture is penetrating a waterproof casing, and a pressure sensor can report on either excessive or substandard pressure. Taken together these sensors can form powerful tools like a remote weather station. The accelerometer and gyroscope are especially important to mobile instruments as they allow a device’s motion to be tracked independently of GPS or other external location measurements. Most smartphones already have some of these features, but the BLE TI-SensorTag handles a wider range of conditions than most smartphone components. 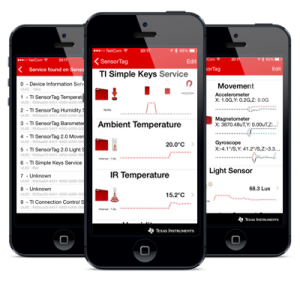 EOSPY supports the TI-SensorTag simple keys notification. Press one of the buttons on the TI-SensorTag and the EOSPY server will respond with the notification on the map. Finally, the magnetometer measures magnetic fields and electric currents, providing a safe means of remotely monitoring electric grids and power generators. Executive Order is a premier custom software development company offering diverse solutions to help our clients and organizations achieve their goals. We are a leading provider of technology that helps global companies design, develop, deploy, and integrate software applications. Delivering best-in-class solutions dedicated to interoperability, we assist enterprises of all sizes to move toward web-based computing while continuing to leverage the benefits of legacy systems. We also provide businesses with software development services to help become more efficient and effective with GPS tracking and remote data monitoring. If you are searching for an IoT or BPM software developer expert, we have a wide range of in-house and outsource experts in different business sectors. Download Our Executive Order Project Consulting and Custom Applications Professional Services and Professional Software Development Service Brochure. Want to know more details about Executive Order and our custom software development services, please feel free to contact us.